Marilyn SanClemente February 19, 2015 February 19, 2015 3D Item, Birthday, Cards that Move, Occasions catalog, Stampin' Up! Today I have a handmade Birthday card that I made for a Fr iend’s birthday last week. 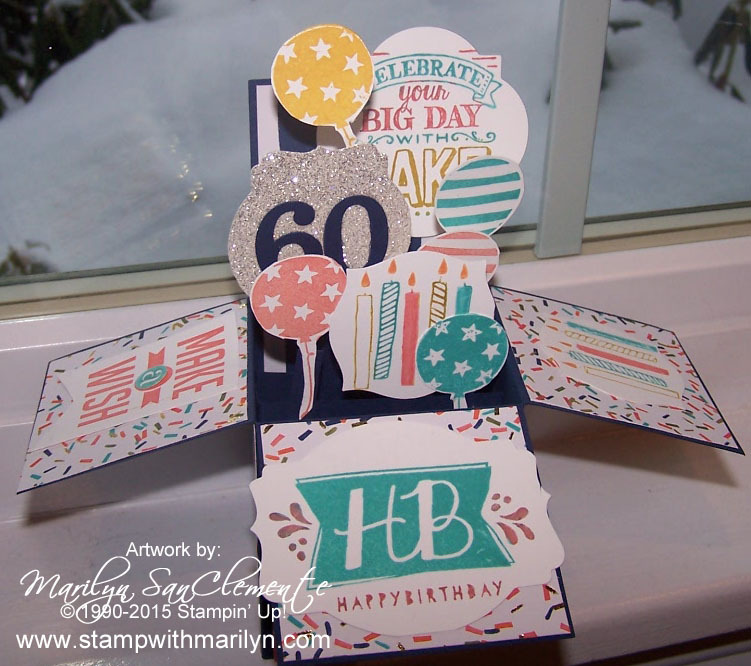 This 3D card uses the Birthday Bash designer paper from the Occasions catalog and the Balloon Bash stamp set. The color combination of the this Designer paper wasn’t my favorite when I first saw it. Why is it that I don’t necessarily like a pattern until I use it! I will definitely be putting together a Birthday card kit with this set and designer paper. 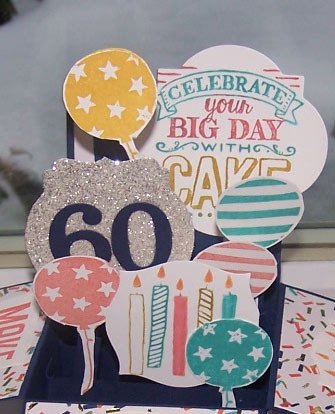 Cardstocks: Birthday Bash Designer Paper, Night of Navy Cardstock, Whisper white cardstock and Silver Glimmer Paper for a little bling! Since there is a lot of area to decorate with this card, I used several Birthday stamp sets: Balloon Bash stamp set, Big Day stamp set from the Sale-a-bration catalog and the Perfect Pennants stamp set for the Annual catalog. The ink colors are: Calypso Coral, Crushed Curry, and Coastal Cabana. The pieces of the card were cutout using a couple of different sets of framelits; the Deco Labels collection framelits, the Window framelits collection and the Apothecary Accents framelits. I used the framelit that best outlined the image. Interested in making a Pop Up Box card? Check out my You Tube video HERE.